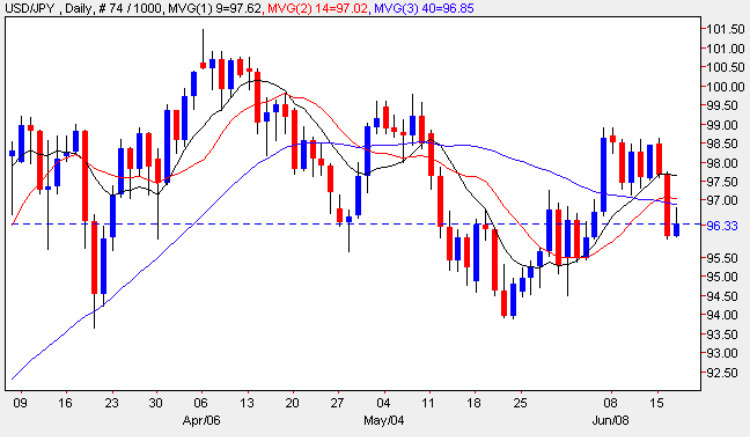 Yesterday’s wide spread down bar on the daily chart for the yen to dollar finally injected some much needed momentum into this moribund pair with the price action starting above the 9 day moving average and finally closing below all three, indicative of the consolidation of the last few weeks. With the 9 and the 14 day moving averages now crossing it seems likely that the bias for the next few days will be to the short side and indeed in this morning’s early trading an attempt to rise has been firmly squashed with the high of the day so far bouncing off the 14 day moving average. The fundamental news on the economic calendar for Japan has included the Bank of Japan’s Monthly Report which confirmed a positive outlook for the Japanese economy after exports improved and factory output increased at their fastest pace in 57 years, all adding to the general optimism longer term. Meanwhile the fundamental news on the economic calendar for the US is covered on the Eurodollar site. My trading suggestion for this pair is to look for some quick and dirty profits on the short side using the 15 minute charts and very tight stop losses.